Which is better for your digital marketing campaigns: Facebook Insights or Google Analytics? When I lead a digital marketing marketing organization, we often discussed whether we needed to explain why the Facebook Insights data looked better than Google Analytics data or vice versa. It seems that for digital marketers, this question continues to come up. After years of debating, here’s our answer to “Which is better: Facebook Insights or Google Analytics?”. The short answer is, either one is ok alone, but when analyzed correctly together (and personalized to the business); they make for a better analytics tool that even some of the best Business Intelligence tools out there. So you already set up your Funnels, Goals, Facebook Page, and are spending money like crazy on ads. Now what? Your next step is to try to understand how you’re driving traffic, who is likely to convert, why they are becoming your customers, and how do you get them to talk about you to their entire networks to generate even more sales. This is where you want a combined look into the data. Before we get into it, let’s discuss some of the really good things each platform can do and where their limitations are. Facebook Insights has a lot of information about the visitors and their demographics, specifically the gender/age group, country/city, language/locale. That information is based on the Facebook profiles, something Google Analytics will not have access to. Insights can also tell you when users access your content from their own wall or when they access your page directly. For data analytics newbies, all of the likes, fans, comments, and post shares allow them to feel good about their campaigns but here is the big downside with Facebook Insights: the available Insights reports are limited to what Facebook decides is important to their clients. Hence, if you want to measure KPIs that actually matter to your individual business (which aren’t offered by Facebook Insights), like your conversation rate, applause rate, amplification rate to try to measure an economic value, you are out of luck. (see: The Top 3 Facebook Insights Metrics: Conversation, Amplification, and Applause Rate if you don’t currently follow those metrics). On the Google Analytics side, reports are more varied and more interactive, however; they are restricted in the content and context depending on how you have implemented the tracking code. The ability to set funnels and track conversions, if well executed, can help you save hundreds of dollars from using another analytics platform. The problem with deciding which one is better is that they each have their inherent strengths. Consequently, if you try to report both Facebook Insights and Google Analytics side-by-side, you will hardly get them to match and trying to explain their differences will drive you mad. For example: Clicks for Facebook represent all of the clicks a user had (ie, open comment or like) whereas for Google Analytics, it’s a very specific metric. So what’s the bottom line? Is Facebook Insights better than Google Analytics? If you understand the differences and strengths between both platforms, you can use both to get a really good grasp of how you drive users to your intended goals, who they are, and ultimately, how they convert to your customers. This is why we say that Facebook Insights and Google Analytics can be very powerful together to understand users, marketing, and sales strategies at a deeper level. 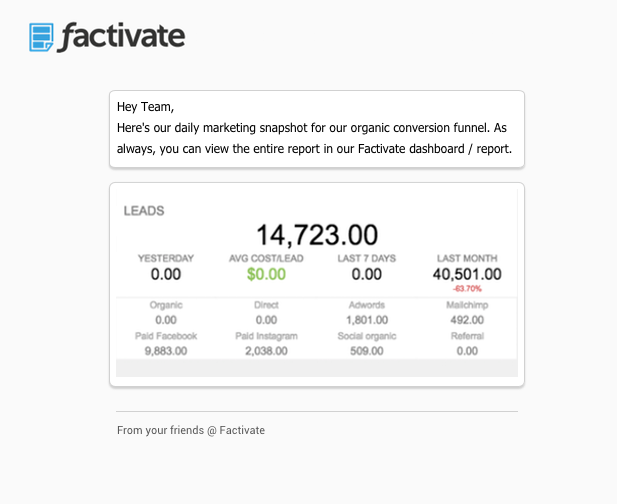 At Factivate, we use our amazing Factivate KPIs template to track all of our important (specifically tailored to our business) business KPIs from Google Analytics and Facebook Insights to get to an actionable metric: economic value per user. This then helps us optimize our content, message, and bottom line. 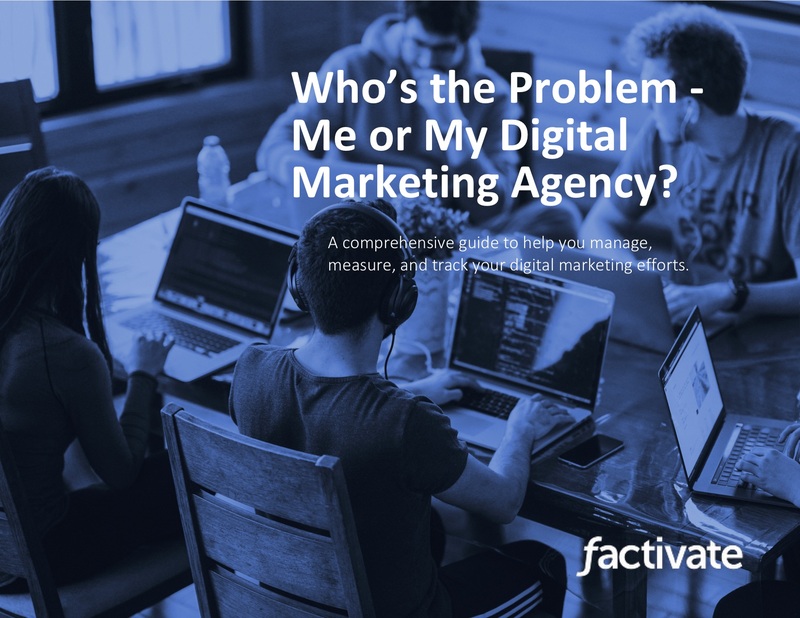 If you’re interested in having a better analytics tool than Facebook Insights or Google Analytics, take a look at our free automated spreadsheet template reports or sign up for a Factivate account to start taking ownership of your data.